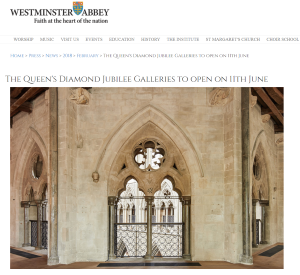 Westminster Abbey has announced that The Queen’s Diamond Jubilee Galleries will open to the public on 11 June 2018, while the museum galleries, set more than 50ft (16 metres) above the Abbey’s floor in the medieval Triforium, will display some of the greatest treasures from the Abbey’s collection. Once described as offering the ‘best view in Europe’ by English poet John Betjeman, the Triforium has never before been open to the public. Visitors will reach the Jubilee Galleries through a new tower, housing a staircase and lift. Named as the Weston Tower, this first major addition to the Abbey church since 1745 will offer previously unseen views of the Palace of Westminster. The total project cost has been £22.9m, all of which has been met by private donors and trusts.